Could you tell me a little about yourself so that we could have a clearer idea of you and your background in film? I grew up in Italy and I live between Rome and London. I could have been a lawyer but thank God I became a journalist first, then an artist and now I feel very proud to define myself a documentary filmmaker. I admit, I’m a lazy person and the first time I had a camera in my hand, my thought was: “Wow, this is much easier then writing!”. My first work was Factory, a TV series about Art, but the film that changed my life is “The Infamous and his Brother”. Now, among my projects, I work as TV reporter. This job gives me the chance to travel all around the world and to find stories to tell in my films. Many people will think that this is a film about George Best, the footballer. And although it is not a film about George Best directly, he is present throughout by his absence. Not only his historical absence from his son and wife, his retreats into alcohol, but by the very real physical absence caused by his early death. All of this supplies the melancholic backdrop agains which Calum’s search takes place. Were you conscious of all the films made about George Best and did you have to work hard to avoid certain cliches? There have been so many documentaries about George Best that there was absolutely no need for another biography. I was sure of that from the beginning. George’s life has been explored in every possible way and I wanted to film something contemporary. In one of our first meetings, Calum told me that when he was younger he had no idea of what his surname meant. He grew up in Malibù and he had to explain to all his friends that his charming father (that visited him sometimes), even if he looked like it, wasn’t an actor. He told me that he was proud of the football George did, he watched all the videos, but in the particular moment of life he was in at that time it was not enough. He needed to find more depth in the relationship with his father. George had a special aura. He could see it through the people that loved him, but he never had access to it. So, what was it that drew you to this father and son story? I had a charismatic Californian guy, Calum, ready to start a journey to discover the dark side of a British icon. I’m a massive football fan and, of course, I knew George, before I knew Calum. George was more then a footballer, his irony and his taste for beauty transformed him into an iconic figure. I knew his sentences more then his goals. In particular the one that everybody remembers: “I spent a lot of money on girls, booze and fast cars, the rest I squandered”. In general, it makes all people laugh. I asked myself what Calum thought about it and I understood then what could be the direction of the film. This film had to be the story of a son searching for a father. Were you inspired by any precedents? The title of the project is inspired by another documentary, that was also about a father-son relationship: “My architect”, by Nathaniel Kahn. Nathaniel, son of the great architect Luis Kahn, tries to find the father, that he had never known, by looking at his father’s architectural masterpieces. How did you first connect with Calum and how did you strike up the trust that is clearly there in the film? I remember very well how it started. 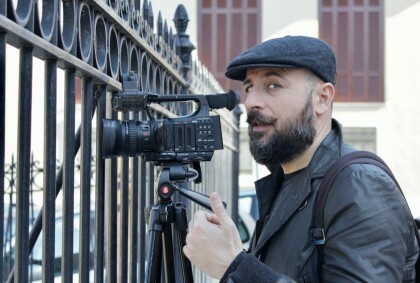 I was in Rome, talking with my friend, the filmmaker Cristina Rajola. A few days before I had presented my documentary film “La via di mio padre” at the Roma film festival. This film is the story of a daughter that decided to meet the terrorist who killed the father she never met. Cristina told me that I should continue to work along that path and I should meet Calum. She knew him because her best friend is married to Erin, Calum’s agent, one of the characters of the documentary. The week after I was in London and I met Erin and Calum at the Botanist in Sloane Square. We built a real friendship from that moment. What was the process of filming like? The camera in the film is very intimate and at the same time quite unobserved. At the beginning, we started shooting just to have footage for a short trailer. To support the pitch for the project. Now I can say that it did not work as we expected, but while were waiting for finance we didn’t stop meeting and filming what was happening. He forgot I was the man with the camera and everything came naturally. It was the first time I worked without a crew, but it really helped me to understand my role. We live in a time where we can high quality recording about what happens around us for the first time, without being invasive. I have interviewed many people in my life: politicians, gangsters, terrorists, movie stars, sportsmen and a lot of normal people. I could see how their face chanced in the moment when the red light turned on. When we decide a precise moment to start recording, we create an invisible barrier that divides how we are and how we would like to be. In the social media age, people are getting used to be on camera. Even a smartphone can film at better quality then the equipment used when I started working. This age opens new perspectives, new stories to tell, impossible before. So I understood that it was the only way for the film I wanted to make. The issue of celebrity is clearly central to the film. Calum of course has just come out of the Celebrity Big Brother House. Does this celebrity hinder the universality of the film or make it more acute? Celebrity is a critical component of the story. Most of the problems my characters deal with are generated by their celebrity. To be famous has negative sides. Something that George and Calum have in common is that everything they do ends up in the tabloids. It’s public and people love to talk about what they do. This element influences their actions, and most of the facts we told in the documentary. The other key theme is one of masculinity and ideas of masculinity. Football is a macho sport yet it has been observed that there was a gentleness and femininity about George Best, a vulnerability, that he seems to share with his son. Do you feel that the corrosive effects of the need to conform to ideas of masculinity is one of the darker themes? George was slave of the image he created but he did not conform at any previous idea of masculinity. He was the blue eyed boy that could make everything possible, the man that never says no to fun. Most people would like to be like him. For example, the guys I met that tattooed his face or his sentences on their body, would like to live his life, but they probably do it just a few Friday nights. He was entrapped in a character everyday of his life. People knew he had alcohol problems but everybody that had the chance to meet him offered him a drink. Because to drink a pint with George Best was something to tell to your friends. He didn’t want to confirm to some masculinity concept, he liked people and he simply never learned how to say no without disappointing them. Addiction is clearly also at the heart of this film. The absence of George Best was caused by alcohol. Yet, it also seems that the absence of something for George Best led to what seems very like depression. Sir Matt Busy, George Best’s manager at Manchester United said that he thought George would commit suicide. Depression and alcohol are often linked. While making this film were you aware of the theories that suggest a genetic link when it comes to depression? And, if so was this film a sort of protracted therapy for Calum, a process of self-development? I was very happy when I read Calum in the Sun, saying that doing this documentary was therapeutic for him. I discovered it when googling my name (yes, I do it sometimes). We never spoke about it, but I appreciated it a lot. It gives sense to all the process. Calum moved to London to stay close to his father, but when George died he was 24 years old. He was alone, with nothing. He had to deal with his demons, to find a direction. I think that his book, “Second Best” has been the first step. He really loved George and to put on those pages all the negativity he has been through, was important. To make this film was the next step, the one he needed to find a self-definition. Finally, documentary film is often talked about as an agent of social change. However, it can also operate at the personal level, be an extremely intimate, an almost invasive activity. It requires an openness and generosity on both sides of the camera. It is a dialogue that can have some resemblance to the relationship within therapy. Do you think that the process of film, of ‘Art’, the taking part in this process can have unexpected benefits in this direction? The relationship between who is in front of the camera and who is behind it is very complex. It’s a strange alchemy where everyone follows their own direction, to achieve, sometime, different results in the same film. Honestly it is not the first time that people I have worked with have described their film-experience in a similar way. Sometime I think, we need an excuse to deal with our demons. Probably filmmakers do the same, using the lives they tell, to investigate a part of themselves. I don’t know if we call it therapy, but sometimes it works this way.